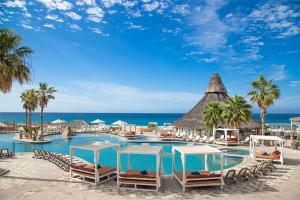 Sandos Los Cabos All Inclusive Resort is nestled on a clifftop at the very end of the Baja Peninsula in Los Cabos. Situated just steps away from the excitement of Downtown Cabo San Lucas and the Marina, Sandos Finisterra has captivating views of the Pacific Ocean on one side and panoramic vistas of the city, bay and Marina on the other. The resort also boasts numerous restaurants and bars, many with panoramic views, as well as a mountainside spa and gym. Divided between the cliffs and the beach at the tip of Baja and within walking distance of Cabo San Lucas, 45 minutes from the airport.